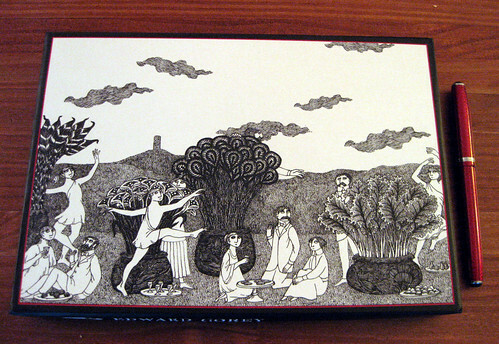 I can't believe this is the first time I've managed to blog about my beloved Edward Gorey stationery from Pomegranate. 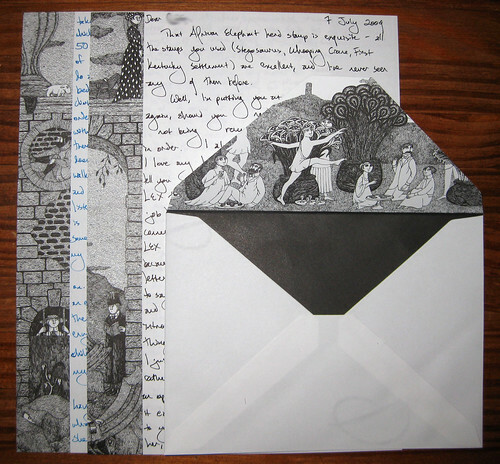 This is great stuff, with part of a drawing sliced down the side of the page. There are 4 designs, and this is one of the sets that gives you more paper than envelopes, which I totally appreciate: 48 sheets, 25 envelopes. As you can see, the envelopes have their own lovely printing inside, though they are not gummed. The set comes with stickers to seal the envelope, but I usually add some more stickers just to make sure it stays sealed through all the postal machines and such. Anyway, the paper is of an excellent weight and texture, takes fountain pen ink beautifully and never feathers or bleeds. They're currently on a half price sale at Pomegranate, but they've been like that for about a year now... my paranoid mind worries that perhaps they are going to be discontinued, so of course I've stocked up. Oh, YUM! Why haven't I seen this before?! FP friendly stationary and a favorite artist - too delicious. wow this looks good and would not mind having it .Nice stationery. Hope you've been well and having a lovely summer! I just ordered and they are still half-off. Very beautiful stationary, I can't wait to put pen to paper when it gets here. The stickers are not terribly awesome. 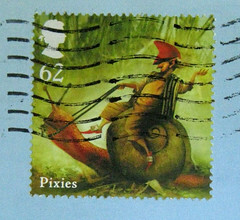 They're all of a single design, a round seal, with a dog hanging in a net in black and the words "Edward Gorey" in red.